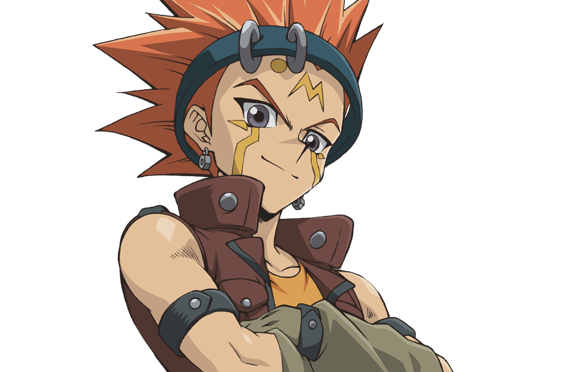 Crow Hogan is one of Yusei’s friends and a thief. His parents died when he was little, and he was alone until Duel Monsters gave him friends and taught him how to read. He passes his knowledge on to a group of children he looks after, and his motives for stealing are to provide for them. He later became a member of the Enforcers with Yusei, Jack, and Kalin, but he quit due to not wanting to hurt any children. His custom Duel Runner, Black Bird, has a built in Flying Formation used to cross large gaps and can also fire hooks to change direction. He uses a Blackwing deck that can quickly summon monsters and use their abilities to win a duel, and his main Synchro Monsters are Blackwing Armed Wing, Blackwing – Silverwind the Ascendant, and Blackwing Armor Master. When a fog causes all his friends to disappear, he takes his anger out on the Dark Signers, and ends up in a Manual Shadow Turbo Duel with Greiger and defeated him. 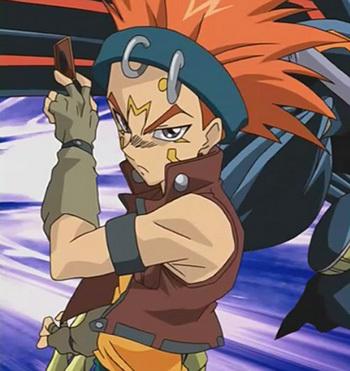 After facing Goodwin alongside Yusei and Jack, he inherits Yusei’s Tail Birthmark, becoming a Signer. Though Crow possesses similar qualities and ideas as Yusei, such as helping others when needed, he is a daring person who will rise up to any challenge and show that he is not to be pushed over. He is also generous, as he only steals in order to help people who are less fortunate, including underprivileged children, similar to the works of Robin Hood. In the English version he speaks with a Southern accent and is very suspicious and stubborn. He also has a fear of clowns due to an incident on his 5th birthday. One unique thing about him is the Criminal marks on his face; he has been marked at least twice having only the “M” during The Enforcers and gaining the dot and eye marks after leaving the team. Crow was orphaned after his parents died during the Zero Reverse incident. After that, he spent a lot of his time wandering around Satellite alone. Having not been to school, he could barely read, spell, write, and perform arithmetic. One day, while wandering around a dump, he found some Duel Monsters cards. While admiring the cards later, he met a group of people, who befriended him and taught him how to play Duel Monsters. Through Duel Monsters, Crow improved his reading and arithmetic skills. While playing Duel Monsters with the other children, he came to know Yusei Fudo and Jack Atlas. Crow reunites with Yusei, after Yusei returns to Satellite. Yusei takes him back to his base, to visit his friends. However, the Security, who were after Crow earlier, track him down. Crow arranges a rendezvous at Daedalus Bridge, while he and Yusei team up in a Tag Turbo Duel to defeat the Securities. Crow and Yusei meet up with Blister, Nervin, Blitz, Tank and Rally at the rendezvous point. Crow introduces his friends to the children and tells the legend of the Daedalus Bridge. Later that night, Yusei tries to leave in order to investigate the place where he thinks the Dark Signers are located. Crow refuses to let Yusei go without him. Riding their Duel Runners, they see a huge shadow beast and head towards it. Crow nearly gets hit by the card “Vorse Raider” throw by Kalin. Kalin, now a Dark Signer, sets up a huge shadow field in the shape of his birthmark, the Giant, separating him from Yusei in order to engage in a Shadow Turbo Duel against Yusei. After a large shard impales Yusei, Crow takes him to Martha so he can be operated on after the Shadow Turbo Duel came to an abrupt end without a victor. After Yusei recovers from surgery Crow, is glad that his friend recovered. When Lazar goes to Satellite on Goodwin’s behalf, Crow sees him, and mistakes him for a Dark Signer. Crow corners him in the same place where the Enforcers defeated the Magician’s Four, and forces him to Duel using the same house rules that the Duel Gangs did back then. However, the advent of the black fog causes the Duel to end prematurely. Crow rushes to escape on his Duel Runner. Crow takes refuge in a refrigerator, to avoid being captured by the fog. After the fog clears, Crow searches Satellite, finding everyone has disappeared. Shortly afterwards, he finds Greiger, who is also now a Dark Signer. To avenge the children Crow imposes a Shadow Turbo Duel. Greiger initially refuses to Duel a non-Signer, but Crow manages to let on he has a bomb in order to convince Greiger to face him. Remembering Yusei’s encounter with an Earthbound Immortal, Crow insists that both players turn off autopilot, as he thinks he’ll need his own manoeuverability to dodge attacks from an Immortal. Yusei interrupts the Duel, insisting that both players should stop. Crow refuses and tells Yusei of his reasons for challenging Greiger. Greiger later Summons “Earthbound Immortal Chacu Challhua”. Just when all seems lost, Crows draws his final card. He then goes on to Synchro Summon “Blackwing – Lone Silver Wind”. Using this card, he ends up winning the Duel, making him the first non-Signer to win on his own against a Dark Signer. Once Greiger’s Earthbound Immortal is defeated, Crow indirectly freed the people from Greiger’s village which including Annie and Max. However Greiger consequently turns into dust as he loses. He later watches Yusei’s Duel against Kalin as a spectator alongside Luna, Leo, and Trudge. After the duel finally ends with his victory, Crow and the others later accompany him to where the Original Enerdy Reactor is as Roman Goodwin has now challenge Yusei to a duel. Once there while Yusei, Luna, Leo and Trudge enters through the stairs from the crater, Crow spots another opening as he notices some Security helicopters near. So he goes to check it out while Yusei and Roman’s duel is taking place. However, he finds a picture of Yusei, and his parents and doesn’t know who they are. He also finds Goodwin, but all Goodwin tells him is if Yusei beats his brother, he will be waiting for him. Goodwin escapes, so Crow finds his way to the Original Enerdy Reactor, much lower then the others, as Yusei confesses that he feels responsible for everyone’s lives being ruined because of his fathers experiments. Crow yells back, saying that he didn’t know Yusei was harbouring these feelings, and that he was sorry he didn’t notice. But, Crow feels really happy that he made friends with him and Jack and many others. He yells out as Yusei falls into the Enerdy, but is unable to do anything. Though, he reaches the level Luna, Leo, and Trudge are on, and while Leo believes Yusei is dead, Crow firmly believes Yusei is alright, because Yusei could never die here. He is surprised, but glad, when Yusei returns, though unconscious. He and Trudge catch Yusei, and set him down on the ground. Crow tells Yusei to wake up, believing that he is still alive. Yusei does wake up, though a little weak. Crow, Yusei and Jack engage in a Turbo Duel against Goodwin, as he plans to sacrifice a Signer in order to welcome the arrival of the King of the Underworld to New Domino City. Through the duel, Rex revealed that he was the legendary man. However, Crow still fight for the legend regardless of Rex’s remarks. When Rex uses His Earthbound Immortal’s effect to lower Crow’s lifepoints to 1, he is blown out of the geoglyph from a combination of the effect and one of the creatures from the King of the Underworld. He uses the flight mode on his Duel Runner to fly back up and take out Rex’s Moonlight Dragon Quilla, as well as activating his Blackwing – Anchor trap. Crow then lands on the geoglyph but as one of his Duel Runner’s wings break, he then falls down and is unable to continue with the duel. Even though eliminated because of this, his Blackwing – Anchor remained active and was used by Yusei later on. Before Goodwin is about to be defeated, all the of the Crimson birthmarks return to their owners. However the Dragon Head mark appears on Yusei replacing his former Tail mark. The Dragon’s tail birthmark, however, appears on Crow, causing him to inherit the role of the fifth Signer. Crow later becomes a delivery man, calling his service Blackbird Delivery and using his Duel Runner as the vehicle. He, Yusei, and Jack share an apartment owned by Zora and spend almost all of their time designing a new Duel Runner engine, with Yusei focusing on schematics and Crow and Jack focusing on testing it out. Later, after Trudge is attacked by Ghost, he, Jack, and Yusei search for Ghost on the highway. After Yusei finds Ghost, the other two are left to watch their duel. After Yusei defeats Ghost, they find out he is a robot and Yusei believes that a new threat is coming. Crow is given the job of convincing a withdrawn man, Tetsuzo Kuzuyama, to move into Martha’s, due to the dangerous nature of his own house. Crow is subject to a series of traps, as he tries to enter Tetsuzo’s house, causing him to stumble upon an old fashioned Duel Arena. Using it, Crow duels Tetsuzo in order to convince him to come to Martha’s. After Crow wins, the mountains of junk at Tetsuzo’s begin to collapse, but Crow saves Tetsuzo by pulling him into a refrigerator. Crow, Yusei, Jack and Blister learn that Tetsuzo misses his son. They tell him that they can be his sons and convince him to come stay at Martha’s where he’ll have plenty of grandchildren. On the day of Akiza’s final exam, Crow and Jack help Yusei modify and improve her Duel Runner so she can Turbo Duel and obtain her license. Like the rest, he is present during her first official Turbo duel, in which she is able to defeat Trudge. Crow plays a Blackwing Deck which focus upon swarming the field as quickly as possible with Blackwing monsters including the Synchro Summoning of “Blackwing Armor Master”, “Blackwing – Silverwind the Ascendant”, or “Blackwing Armed Wing”. Most “Blackwing” monsters resemble Crow’s namesake, black-winged birds or birdlike humanoids. In Tag Force 4, Crow focuses more on a Swarming strategy with his Blackwings, as well as cards that destroy the opponent’s deck. Crow has two Decks, one for Turbo Duels and one for normal Duels.